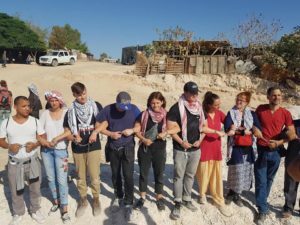 Ottawa—Independent Jewish Voices Canada (IJV) is dismayed to learn that a Canadian student has been arrested by Israeli forces for protesting the impending demolition of the Palestinian-Bedouin village of Khan Al-Ahmar in the Israeli-occupied West Bank. The United Nations, European Union, Britain and France have all demanded that Israel halt plans to demolish the village. They noted that destroying the village would be an absolute contravention of International Humanitarian Law, which strictly prohibits the destruction or confiscation of private property by an occupying power. The United Church of Canada is also campaigning to stop the demolition of the village, calling on Canadians to write to MPs urging the Canadian government to intervene. Khan Al-Ahmar residents belong to the Jahalin tribe of Bedouin. The Jahalin were forcibly expelled by Israeli forces to the West Bank from what is now southern Israel in the 1950s. Now, the Jahalin are again faced with compulsory transfer; this time to make way for illegal Israeli settlement expansion in the area. Israel’s plan is to transfer Khan Al-Ahmar’s 180 residents to an area adjacent to a garbage dump. Israel claims that it is within its right to demolish the village, since the residents did not obtain construction permits, a requirement for Palestinians living in Area C. Area C accounts for more than 60% of the West Bank and is under full Israeli civil and military control. “Israel’s claim that they are doing this because of a lack of permits is a bogus excuse. There is no way they would have given permits to Khan Al-Ahmar residents and they know that,” said Balsam. Israel’s objective in demolishing the village is widely known and has been the subject of years of diplomatic pressure. By expanding its settlements in the area, Israel plans to split the Palestinian West Bank into two and isolate East Jerusalem from West Bank Palestinian, thereby making the possibility of a Palestinian state even less likely. “IJV calls for the Canadian government to push for the immediate release of Michaela Lavis and to join its European allies in demanding that Israel immediately halt the demolition of Khan Al-Ahmar,” concluded Balsam.